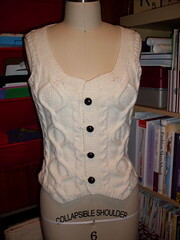 I finally steam blocked the edgings on this vest this afternoon and tested out some button closures. 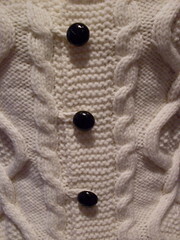 I ended up crocheting some button loops on the inner edge of the placket. I just didn't want to cut buttonholes into the finished garment. It seems to be a pretty good solution for now, and easy enough to change if I don't like it later on. I don't know if I'll wear it that often completely buttoned up, but it works! That's a super clever solution! What a genius :) It turned out great, that cable on the front is gorgeous.